Selflessness takes Spirit of Friends to unimaginable heights of glory football over 1. FH Schienenersatzverkehr. It was another epic Uni Liga match. Goals galore and beautiful, flowing attacking football from both sides. Spirit of Friends will grab the headlines for a thunderous second half display, but on this icey cold winters evening, football was the winner ladies and gentlemen. Did it end 7-3 or 7-4? Does it really matter? Do you, the reader, really care? 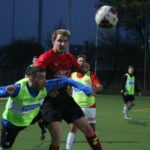 After a slow start to the Uni Liga season, Spirit of Friends picked up only 4 points from their first 6 matches. There were grave deliberations in the organisation. What was wrong? Did the team need a new trainer? Was it time to bring back the famous Sven Sharp-as-a Messerschmidt out of retirement? And what about the injuries (Ghozi, JB, Niklas)? Even super sub Dr. Prof. Cellner couldn’t find a cure. Was it time to do something out of the box like warm-up before matches? 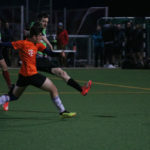 Spirit of Friends had been seen to be a dark horse for the Uni Liga championship but internal bickering, tactical tragedies and school boy errors had left them facing relegation and in danger of missing out on the millions of Euros in the new tv rights deal negotiated by Lais and the Uni Liga for the coming season. The owners (Conrad, Dirk Dogler and Sven Söderberg) and the consortium led by a secret American investor and undercover CIA operative as well as Slow Budget Productions were beginning to panic. And on the field it wasn’t much better. In a previous match, Spirit’s Argentinian import, who had failed to live-up expectations after his international border crossing transfer, left the field during the match, throwing his shirt into the ultras as he left the stadium, speaking to no one except to himself in quick fire Spanish. The defining moment of the season for Spirit of Friends could be the moment that Joaquin finally accepted that he had become German. He decided to change his name to Yo-Achim. Has there ever been a more selfless act in the history of football? It certainly seemed like a momentum changer. Suddenly Spirit of Friends was playing total football. Beautiful fast flowing one touch combination football. Of the many hundreds of fans in attendance, Robert Pohlig has this to say: „Spiriti of Football showed us today that nothing in the world is more important than the Spirit of Friends“. BG had his best game of the season in goal. Yes, as goalkeeper! In previous years, Germany’s next top Amateur Footballer of the Year was banging the goals away as striker extraordinaire. One could sum him and all of this up up in one word: Selfless. It was a selfless performance from back to front. Flo was immense at the back again. A rock. Benny Linse dominated the midfield. Is he a man or a machine? Basti Bartl was pure aggression, timing and speed and he was really well behaved towards the referee. We don’t need to go into details about who scored when. It was a magnificent team display by Spirit of Friends. 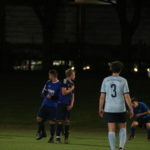 And let’s be honest, there is more to a game of Uni Liga football that kicking a ball around. After the game, Glühwein was served. Nice and hot. And the magic continued in the changing rooms. Nakedness. Beer. Boys revelling in defining moments of the game. Key scenes were embellished. Refereeing decisions discussed in a fair and balanced way. What could be better I ask you? Winning with stylish football, the changing room banter and then long hot showers. It was the stuff of dreams. A classic Uni Liga evening. The resurgence of Spirit of Friends. A night of goals, celebration, the coming of age of a team and the shared privilege and the pure joy that only playing football can provide. And the man of the match was Günni – what a a left back. The Steve Nicol of the Uni Liga!